Where did the Inuvialuit come from and how did they find their way to this beautiful but remote part of the world? By Fr. Jon Hansen, C.Ss.R. I am in Paulatuk where the people have gathered for “Iqalukpik”, the annual Arctic Char Jamboree; a thanksgiving celebration for the abundance of fish and wildlife which sustains the community throughout the year. It is a homecoming event and people from across the region have returned to join the festivities. As I look at the many faces and families who have congregated I ponder the questions of who these people are, where did they come from and how did they find their way to this beautiful but remote part of the world? 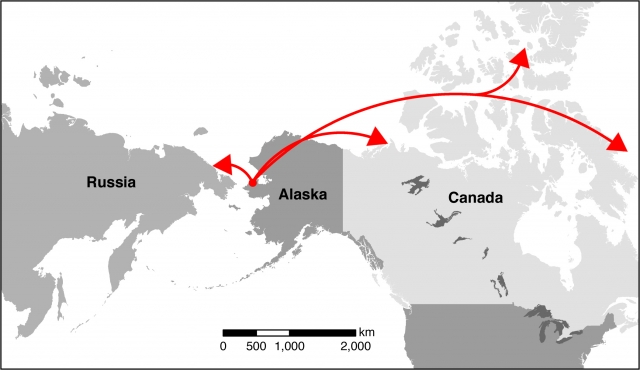 Evidence shows that the Canadian Arctic has been populated by human cultures for more than 4000 years. The earliest known group were the Pre-Dorset who migrated eastward from Siberia and the area we now know as Alaska, and across the northern regions of present-day Canada. These people survived for a time in the difficult conditions of the north but did not flourish and signs of their presence in the western arctic show that they disappeared from here about 2500 years ago. The next wave of migration was the Thule people who also made their way east from Alaska about 1200 hundred years ago. The Thule followed the seasonal path of the bow whale which slowly extended eastward as the Arctic warmed and soon the people found themselves settling and adapting to the new environment. It was from this small group of nomadic hunters that the modern-day Inuvialuit evolved and began to thrive in the region of the western Canadian Arctic. Today the communities of Paulatuk, Tuktoyaktuk and Ulukhaktok hold on to this culture and language and collectively are known as “Siglit”, people of the coast. Contact with outsiders first began as rumours of “Tan’ngit”, strangers, coming from the east and west by land and sea. These strangers were the early European explorers searching for trade routes through the North-West passage. It was not until the early 19th century that formal introductions took place when an expedition by Captain John Franklin, to the mouth of the Mackenzie River and the nearby coasts, revealed the Inuvialuit people to the rest of the world for the first time. News of the expedition spread quickly and inspired many other voyages and contact between the Inuvialuit and European explorers, fur-traders and missionaries would quickly increase. For better or for worse, the people from these disparate cultures would be strangers no more. Trading amoung the Inuvialuit was a long-standing tradition between neighbours but with the arrival of European fur-traders and whalers the nature of trading changed. New commodities were introduced into the communities that would make life easier such as steel tools, traps and firearms. Along with these goods came unwanted and harmful baggage like new diseases and alcohol. Following the traders, missionaries arrived. At the time, religious tradition in the Arctic included animism, a belief that all animals had spirits that could be angered and appeased, as well as Shamanism in which certain individuals in a community were seen to harbor supernatural powers. One story tells that, when a Christian missionary taught that Jesus could raise people from the dead, the people were not surprised because their own Shaman did those kinds of things all the time. Christianity was received slowly but had an effect over time bringing changes to traditional practices such as marriage which had not existed except as a practical partnership, often arranged by parents and recognized by the community. Ironically, with many communities devastated by diseases introduced by foreigners, belief in traditional medicine and practices fell out of favor and reliance on the medicine of the Tan’ngit became more acceptable along with his religious practices. For a time, there was a harmonious relationship between the Inuvialuit and the Church with many communities offering large pieces of land for the opening of missions. The balance of power soon began to shift however, with control of the people’s lives coming more and more under the influence of the Church and of government. This is perhaps best reflected in the Residential schools which were opened across the north, the negative effects of which we are now trying to heal across our country. Today the Inuvialuit are regaining their autonomy. In 1984, after a long and arduous process, the Inuvialuit Claims Settlement Act, known as the Inuvialuit Final Agreement, was signed into law ensuring the self-determination for the Inuvialuit about the future of their culture, the stewardship of their environment and their participation in the Canadian government, society and economy. Once again they are able to celebrate and be proud of their heritage, culture and language. As a priest in this community I am conscious that I come from a very different culture and represent a church which the people love but which also has caused them pain. Still, I find myself a welcome guest in their midst. As we journey and embrace the work of reconciliation and healing it is my hope that we can continue writing the next chapter of the story together.